One does not become a kabuki actor, it's a male-only birthright. There are kabuki dynasties, and only the oldest son can star in kabuki theater. 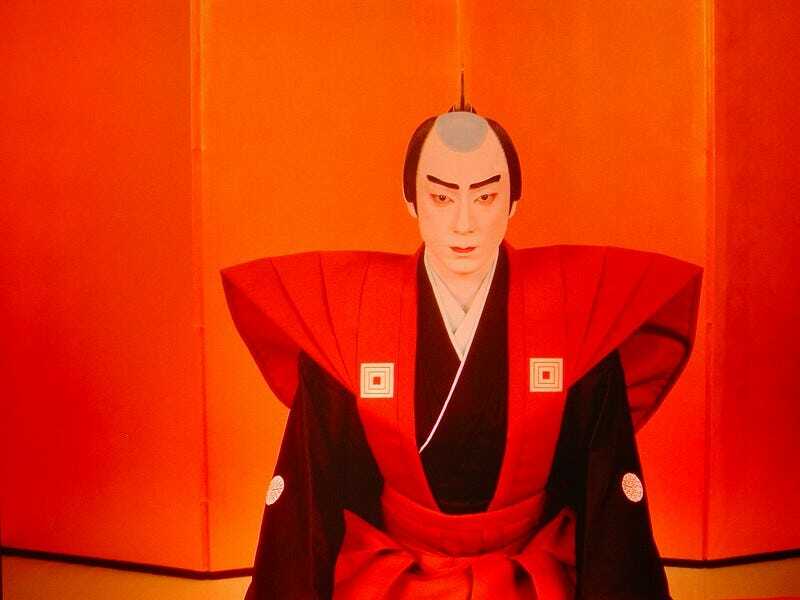 One of Japan's most popular kabuki actors just got his face smashed in. And it might cost him his career. Ebizo Ichikawa XI, 32 years old, was born Horikoshi Takatoshi and began training for kabuki as a toddler. Following in the footsteps of his father, he took the stage name "Ebizo Ichikawa" in 2004. Kabuki is similar to royalty in that actors have a family lineage and stars not only represent the art of kabuki, but Japanese culture. 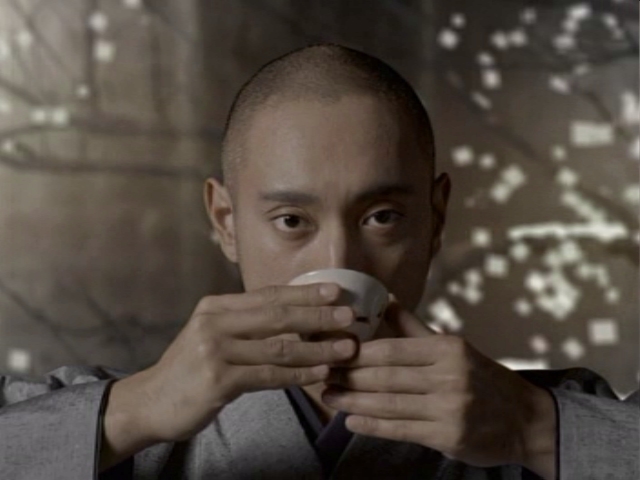 Besides kabuki, Ichikawa stars in green tea ads and appeared in his first television role as legendary samurai Musashi Miyamoto in a NHK drama. Besides his impact on Japanese history and philosophy, Musashi Miyamoto is also a playable character in action game Sengoku Basara 2! Late last Wednesday, Ichikawa was out drinking at a gay bar with kabuki colleagues in Tokyo's Nishi-Azabu neighborhood, near Gonpachi (also the locale of Capcom's Tokyo Game Show event). Towards the end of the evening, Ichikawa ended up at a member's-only karaoke bar. Apparently, Ichikawa said he was looking for a friend who got sick from drinking too much. The actor was then supposedly struck in the face by a man, who blamed Ichikawa for the friend getting ill.
"I was hit by a dark, foreign looking man," Ichikawa told police. Initially, it was thought that Ichikawa said that as the ubiquitous foreigner is often an excuse so that the press do not pursue the issue. Today, it was revealed that a warrant was issued for the suspected attacker's arrest. The man, age 26, is apparently a member of a biker gang and a friend of the individual who got sick from drinking too much. Ichikawa was punched repeatedly in the face, losing a front tooth, and the actor was left with a broken cheekbone, a black eye as well as multiple bruises all over his body. His blood was found on the bar's walls and the staircase — from the 11th to the ground floor. According to reports, Ichikawa was continually attacked as he made his way down the staircase. There are rumors circulating that Ichikawa was hammered the night of the attack and even bragging about his fame and bank account. 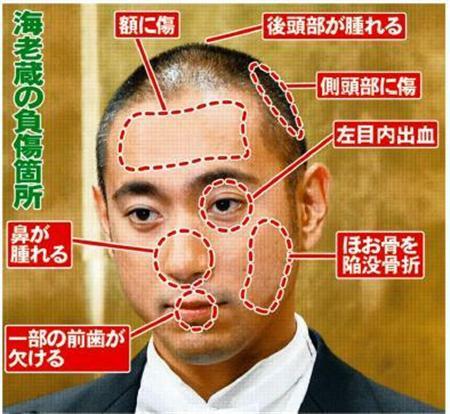 Ichikawa was treated at a hospital, and his wife contact the police the following day. The actor is undergoing facial reconstructive surgery and will take six weeks to recover. He canceled all foreseeable performances. The fallout of from the scuffle could be more serious than missing a few performances. In kabuki, the face is of the utmost importance. Performing requires complex facial movements like nirami. There is a chance that even a full recovery might not mean a full recovery for kabuki and could cost Ichikawa his career. That is, unless he isn't already being pressured by his family to step down.